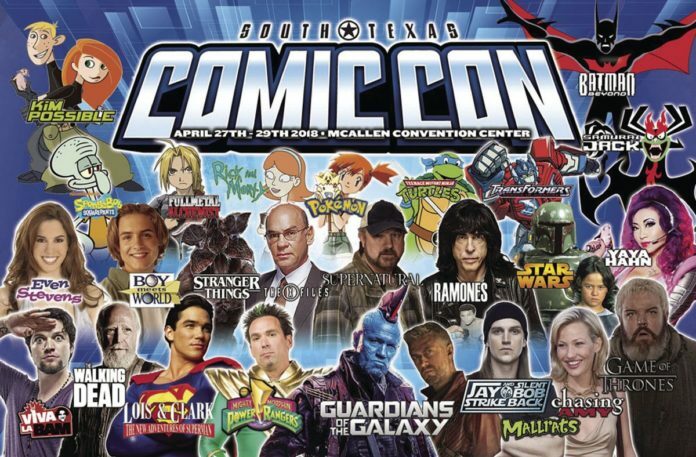 South Texas Comic Con will be taking over the McAllen Convention Center this weekend, bringing with it a star-studded lineup which includes faces from the Marvel Cinematic Universe and “The Walking Dead,” to name a few. Among them, Jason David Frank — best known for his role of Tommy Oliver in the Power Rangers series — will be making his return to McAllen this year. He said his recent trip there was an intense one, taking him from Houston to New York then to Hong Kong and from there to Holland then to Dubai then back to Houston. However, spending long stretches of time in airports has become customary as he travels all around the world to attend comic cons like the one here. When he attends cons in different cities, he said he tries to find out what cuisine they specialize in but many times he just ends up getting Mexican food, his favorite kind and one of the best things about coming to the Rio Grande Valley. But of course it’s not just the food. South Texas Comic Con is one of the biggest shows he does and “it’s a good town,” he said. People who wait in lines to see will most likely know him best as his Power Ranger character, arguably the most iconic character in the long-running series. Among his other roles, he’s played Bloodshot in the web series “Ninjak vs. the Valiant Universe,” which is based off a comic book. In addition to his role of Draxon in the upcoming “UnderDogs Rising,” he continues to post videos, which he describes almost like a reality show, on his YouTube page. Because of his fans who grew up watching him as a superhero, Frank said he wouldn’t take Rated R roles and feels uncomfortable saying certain swear words on screen. However, he thinks all roles are good so long as they have a purpose to them. When it comes to playing evil characters, or the evil side of an otherwise good character, he likes to use his role as a teaching tool. Another important part of his life is his relationship with God. Frank is a Christian but doesn’t really talk about it because he doesn’t like to push his views onto other people. “You can just feel the blessing, the passion,” Frank said. Frank will be at the event on all three days of the convention which will be from Friday through Sunday. COST: Adult passes start at $22 general admission for Friday and Sunday and $27 general admission for Saturday admission. Purchase tickets for admission and photographs online at https://www.southtexascomiccon.com.